For the Swiss logistics company Swiss Post we developed the game «POSTMAN» by order of and together with Jung von Matt as a part of a media campaign to show their vast network of access points. The app focuses on walking around in the real world, collecting virtual items and completing missions. The mixed-reality part of the game demands from the players that they move around in their surroundings. The minigame presented in this article was conceived to offer an additional way of enjoying the game while not actively moving around, for example when staying at home in the evening. It offers a fun gameplay mechanic and also lets players collect items that they can later use in the mixed-reality missions. The minigame unites several important parts. It offers an engaging, easy to learn and hard to master gameplay, ties into the game’s economy by rewarding items for good playthroughs, and connects to the Swiss Post’s core concepts. A brainstorming quickly led into the correct direction, taking cues from popular smartphone games with a match-3 mechanic and adding a gameplay twist – connecting homes and post offices on a city grid – an element that ties nicely into the overall POSTMAN theme. The basic idea is simple: The player is a postman delivering packages. The map is shown as a grid of cards with roads and buildings on them. The player draws a path with their finger, following the roads. Every house and Post location on the grid grants additional points. 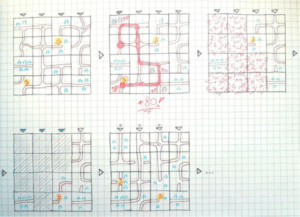 The used cards get removed and new ones fall down, refilling the grid and allowing the player to draw the next path unless no more valid connections exist. Smart planning and thinking ahead help in drawing longer and more profitable paths. The more points the player earns, the more items they win. This animation shows an early prototype of the cards filling the grid, being removed, falling down and new ones filling the grid up again. In this state, the drawing of paths has already been added, making it the very first basically playable version of the minigame. At Gbanga, we embrace a step-by-step, player-focused approach on game design. Even if many important concepts – such as houses, scoring, the game-over condition and nice visuals – are not yet implemented, our testers were already able to experience the basic interaction. If the game – or, rather, toy at this stage – is fun to play around with already, it’s a good sign that the game is on a good path. Showcasing the scaleability of the system, this is a test with 50×50 tiles grid, which of course would be hard to play even on a tablet 😉 Designing engaging gameplay experiences is not only about finding a solid core mechanic, but also about balancing (like difficulty), frequent testing and playing around with parameters. We always strive to make any gameplay-relevant property of a gameplay prototype as parametrisable as possible. The less painful changes to these values are, the more open are we as developers to frequent iteration, resulting in a much more balanced and, ultimately, fun gameplay experience. We continually added more features while testing every version. this animation already shows the rendering of the drawn path, a real-time scoring feedback and undoing the path by following it back to its origin. Scoring is extremely basic in this version, adding 10 points for every card, another 10 for every house, and increasing the overall multiplier by 1 for every Post location. We are now making quite the leap from the last version, in a mostly visual upgrade. Having received the mock-ups from Jung von Matt, we implemented the new graphics. Note that the top bar itself is just a static image meant to give the user the feel of the complete app, while we focused our work mainly on the gameplay. On the grid itself, new elements have been added. While Factories give a lot of points (and appear way too frequently in this example! ), trees serve a purely decorative function. You might also have noticed the improved graphics of the streets themselves, with corners and intersections looking much better now. The entire street network is made up of separate images – up to 5 per card, to be exact: a card center piece and one for each edge. The center piece is dynamically calculated based on the surrounding edges. If you look closely you can see the gaps between the individual parts, a problem we solved later thanks to the optimisation of the tiling. With the core minigame now working and all players and testers already having fun playing it, it was time for some improvements that didn’t affect how the game played, but how it felt while being played. In the animation you can see the slight wobbling of the score numbers when drawing the path. Every single card on the entire path that is cleared now quickly rotates around itself before disappearing. The card that the finger currently rests on has also received a little wobble effect, making the path feel more alive and giving a positive feedback to the player. After these more visual improvements it was time to go back to what the minigame was created for in the first place: collecting items. A bar was implemented above the playfield, showing the player how far they are from earning the next item. Additionally, the current score and all-time highest score are now also displayed correctly. The next step was improving the algorithm which distributes the cards. The goal was that the minigame should always be fair. This meant that in the beginning it had to make sure that there are a number road connections already possible. Also the lowest row should not contain streets that only have a connection down or to the sides, as these are impossible to get rid of. The animation shows an example of this algorithm in action. As a separate part of the minigame, the character on top of the game can now say a variety of helpful phrases. While some could be completely random, the tips can also come at specific events, like when a particularly long path has been drawn or when the player is very close to getting a new item. In this update, new graphics for the path have been added. The line now appears as a golden road floating above the regular ones. This version is now pretty close to the final game, but dozens of improvements have been added up to the release. More information is available on our portfolio page. The puzzle was part of the POSTMAN game app for free for Android or iPhones. Gbanga is always looking for talent to craft more exciting games in the future.